YOU DON’T OFTEN FIND the western horse next to an English style horse in the same competition. This also goes for seeing multiple breeds competing together — Arabians, Peruvians, Quarter Horses, Thoroughbreds, minis, warm bloods and even mules. Mountain trail is different. This is a competition where all equines can come together because measuring excellence is more about an animal’s mind, not its shape. 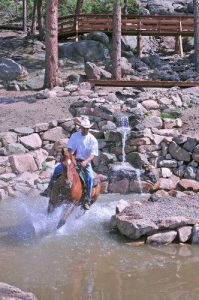 This is a sport where all types of riding disciplines meet side-by-side to test their skills, whether riding in a western or English saddle. This is why the new association founded by Mark and Lee Bolender — International Mountain Trail Challenge Association (IMTCA) — is growing in popularity across the globe. The task of growing a new discipline is almost overwhelming when you consider the challenges. These include standardizing competition, obstacles, training and certifying judges, maintaining websites and insurance needs along with language and work permit barriers in 24 time zones. Still, when all is said and done, the joy that the Bolenders see across the board in building up the sport of mountain trail makes it all worth it. More and more challenges/shows are being scheduled and the excitement is growing. 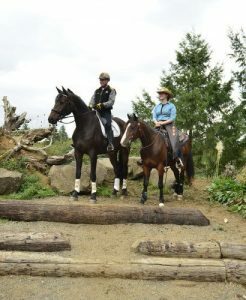 Mountain trail has been introduced at Equine Affaire (Ohio and Massachusetts), and on the West Coast of the US, along with expos in Canada and Europe. In Montreal, Canada they will have a circuit for everyone to compete on in 2016 with four trail courses in the area. Other exciting challenges in 2016 include one in June at the South Point Hotel and Casino in Las Vegas, Nevada. The sport is also seeing more expos adding clinics along with challenges which are well attended. The next expo the Bolenders will be attending is in Verona, Italy in early November. This event draws around 160,000 visitors each year and will be the first European expo to hold a challenge. It’s a major commitment for IMTCA of Italy as they’ve secured one whole pavilion for the challenge where they’ll set up a complete mountain trail course along with many specially built portable obstacles such as swinging and rolling bridges. Stalls were sold out in the first two weeks and this will be the largest challenge held in the world to date. The president of the Italian IMTCA, Lino Tosoni, has obtained sponsors from some of the largest companies in Italy, along with some global companies based out of Portland, Oregon. Sponsorships will be a key to the growth of the sport because travel, prizes and facilities are costly. Another key to building up this discipline is for new mountain trail courses to be constructed across the globe. Some trail courses have been very expensive to build but, depending on the use, they can also be a great revenue generating investment. The last course built in Germany had 1,000 spectators show up to watch a challenge. Since this particular course has been built it has been in non-stop use for training, challenges and clinics. Coming soon in IMTCA will be the “battle of the breeds.” The Bolenders see this as a fun class because each breed can complete on the same level. When it comes to training for competition, there’s actually much more difference within a breed than between breeds. It comes down to disposition. 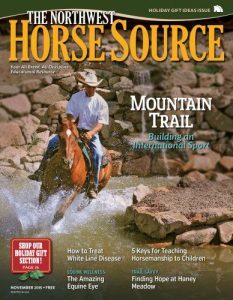 The most desirable disposition for a competitive mountain trail horse includes boldness and confidence. As a trainer, Mark finds these traits in individuals of every breed. A well-trained horse can be observed working out the obstacles on its own; it doesn’t rely entirely on the rider to know where to place a hoof or where to go. Its head is down, ears are forward, and it’s clearly thinking and working out the problem. FOR MORE INFORMATION about IMTCA visit imtca.org. 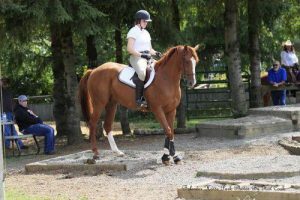 Learn more about Bolender Horse Park, including training and upcoming competitions, at bolenderhorsepark.com.